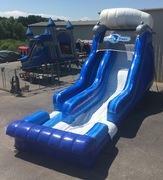 This is our 20' Flipper Dipper Water Slide. This slide is super fast. It features a hump in the middle of the slide that sends kids flying for that extra little thrill. Great for all ages!